The understanding of the pathophysiological mechanisms of arrhythmogenesis in ion channel cardiomyopathies still remains a key scientific challenge. Over the last years, substantial progress has been made in the dissection of the molecular structure-function relationship of cardiac ion channel mutations. Functional relevance of these changes has been further issued in animal models. However, whereas these experiments allow deep insights into disease mechanisms on a molecular and cellular level, the influence on arrhythmogenesis in humans can only be hardly predicted. Using an integrative approach of clinical phenotyping and genotyping in combination with molecular structure-function analyses, in vivo characterization, and bioinformatics, we established a multilevel translational approach to analyze the pathogenetic link between genotype and clinical phenotype. For this purpose, close collaboration with scientific partners on campus (Zebrafish Unit, Interdisciplinary Center for Scientific Computing) as well as remote partners (KIT, Karlsruhe) has been established. This combination of molecular electrophysiology with mathematical modeling allows exceptional insights into the mechanisms of electrophysiological processes. Furthermore this approach provides a unique possibility to assess antiarrhythmic properties of novel therapies. Atrial fibrillation is the most frequent form of cardiac arrhythmias and is associated with increased mortality and an increased risk for stroke. The exact underlying electrophysiological mechanisms of atrial fibrillation are only poorly understood. Genetic defects, resulting in hereditary forms of atrial fibrillation are being increasingly identified. The characterization of the functional relation between these genetic defects and the development of atrial fibrillation can provide interesting insights into basic mechanisms of atrial fibrillation. Within the framework of another DFG funded project the working group investigates the mechanisms of the development of arrhythmias in hereditary arrhythmia syndromes, like Brugada Syndrome, as well as Long- and Short-QT Syndromes. Goal of this integrative approach is it to establish the pathophysiological link between Genotype and Phenotype which allows predicting the proarrhythmic potential inherent in specific ion channel mutations. Within a cooperative project with the center for scientific calculating the working group develops novel mathematical models describing the excitation propagation in the cardiac conduction system. The goal is to get a better understanding of the involved processes. The mutagenesis and expression of ion channel mutations is carried out with the help of molecular biological standard procedures. Expression analysis takes place with the help of western blots or fluorescence optical measurements. 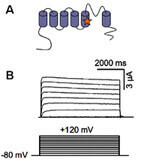 The structure-function-analyses of ion channel complexes are performed with patch-clamp-techniques in cell culture. In well-established cooperations the further characterization in animal models (zebra fish) and also computer models (3D-simulations) can be performed. Two projects are currently funded by grants from the German Research Foundationeutsche Forschungsgemeinschaft (DFG). Fathima Fischer is supported as a PhD-Student at the Hartmut Hoffmann-Berling International Graduate School of Molecular and Cellular Biology (HBIGS). At present there are no job vacancies.